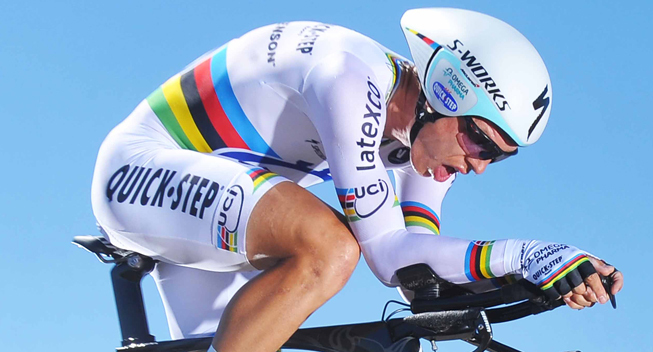 Tony Martin (Etixx-QuickStep) lived up to expectations when he won the 19km time trial on the third day of the Volta ao Algarve but the win was taken by the smallest of margins. Adriano Malori (Movistar) was second less than half a second behind the strong German while Geraint Thomas (Sky) underlined his great condition by taking third and extending his overall lead, losing just 3 seconds to the former world champion. Last year Tony Martin didn’t get his time trialling off to a perfect start as he was beaten several times in his favourite discipline before he finally took a win in the Vuelta al Pais Vasco in the beginning of April. This year this have got off to a much beginning for the former world champion as he won his first ride against the clock in today’s third stage of the Volta ao Algarve. Being one of the GC contenders in the race that he has won twice, Martin was one of the final riders to start the time trial and he faced a tough challenge. Adriano Malori, his expected main rival, had made a remarkably fast second half of the 19km test and led the race with a 19-second lead over Anton Vorobyev (Katusha). Like everybody else, Martin was down on Vorobyev when he passed the time check at the 19km mark but he had gone 10 seconds faster than Malori and so seemed on track for a big win. However, the Italian’s impressive speed in the uphill second half proved to be a big test for the German who lost ground all the way to the finish. In the end, however, he managed to take the win but his time of 21.51 was less than half a second better than Malori’s. Furthermore, he faced a nervous wait in the hot seat as there were several time trial specialists among the late starters. Richie Porte (Sky) had a hugely disappointing ride to finish outside the top 10 and instead it was Martin’s teammate Michael Kwiatkowski (Etixx-QuickStep) who was the first big rival. At the intermediate check, he was 8 seconds slower than the German and at the finish, he had to settle for a provisional third place. As Luis Leon Sanchez and Rein Taaramae (both Astana) failed to pose a threat, it was race leader Geraint Thomas (Sky) who was the final rival. Martin got a scare when the Welshman set the fastest time at the intermediate check, going 9 seconds faster than the former world champion. However, he was unable to maintain his speed and in the end, he had to settle for third, 3 seconds behind Martin. That was enough to extend his overall lead though and so he goes into the queen stage with a comfortable 30-second lead over Martin who moves into second. However, he faces a big test as the penultimate stage includes the famous summit finish on the Alto do Malhao. After a flat first half, the terrain get tough in the finale, and inside the final 50km, the riders will go up the 2.8km, 9.7% final climb twice, with the finish coming at the top after the final passage. After the GC had been slightly sorted out in yesterday’s first hilly stage, it was time for the important 19km time trial from Vila do Bispo to Sagres. After a slightly descending first part, the riders tackled a technical section in Sagres before the gradually climb to the westernmost point of continental Europe. The first rider down the ramp was Carlos Riberio (W52-Quinta da Lixa) but it was the third rider Gustavo Veloso (W52-Quinta da Lixa) who set an early mark of 23.30. He didn’t get long time in the hot seat though as former American champion Tom Zirbel (Optum) posted a time of 23.14 to take over the lead. Yves Lampaert (Etixx-QuickStep) proved his skills as a solid time triallist by becoming the first rider to go below the 23-minute mark, posting a time of 22.31 to take the lead. At the intermediate check, it seemed as though Stig Broeckx (Lotto Soudal) could pose a threat but he faded towards the end. Bram Tankink (LottoNL-Jumbo) made it into third with 23.26 but for a long time, no one was even close to Lampaert’s time. After 45 minutes, however, former U23 world champion Anton Vorobyev (Katusha) hit the course and h was expected to be in the mix in the battle for the stage win. The Russian lived up to expectations when he set a best time of 22.10. Moment later, local time trial ace Rafael Reis (Tavira) made it into fourth with a time of 23.15. Alexander Porsev (Katusha) made it two riders from the Russian team in the top 3 when he stopped the clock in 23.05. He was quickly relegated by Julien Vermote (Etixx-QuickStep) who became the third rider to go below the 23-minute mark with 22.59. All eyes now were on Jan Barta (Bora-Argon 18) but the Czech already lost 17 seconds in the first half. When he reached the finish, he had lost even more and his time of 22.41 was only good enough for third. Much was expected from Jonathan Castoviejo (Movistar) but when the Spaniard passed the time check in a time that was 23 seconds off the mark, he seemed to be out of contention. However, he had a great second part and when he crossed the line, he was second, just 7 seconds behind Vorobyev. Dylan van Baarle (Cannondale-Garmin) had a good ride to make it into fifth with 22.42 but it was Adriano Malori (Movistar) who was expected to pose a threat for Vorobyev. At the midpoint, however, the Italian had lost 13 seconds and it seemed that he was out of contention. Like Castroviejo, hwever, he made a big comeback and he crossed the line in a time of 21.51 to shave 19 seconds off the mark. A puncture had taken Ion Izagirre (Movistar) out of the GC battle but he showed that he is great form when his time of 22.40 to make it three Movistar riders in the top 5. The GC riders had now hit the course and it was Tiago Machado (Katusha) who was the first to challenge the best. At the halfway point, he was fifth but when he reached the finish, he was fourth behind Malori, Vorobyev and Castroviejo. Former world champion and big favourite Tony Martin (Etixx-QuickStep) showed that he ready to challenge for the win when he was only 3 seconds behind Vorobyev at the intermediate check. However, he almost lost it all in the second half and when he crossed the line, he was just fractions of a second faster than Malori. Sergey Chernetskii continued the great Katusha showing when he posted the fifth best time while Richie Porte (Sky) was on a bad day. The Sky rider was only 15th at the intermediate check and his final time of 22.54 was not even good enough for the top 10. Michal Kwiatkowski (Etixx-QuickStep) was riding fast as he was third at the intermediate check and as he reached the finish, he occupied the same position with a time of 22.00. Luis Leon Sanchez (Astana) made it into the top 10 with a time of 22.23 while Zdenek Stybar (Etixx-QuickStep) could only manage 22.52. Rein Taaramae (Astana) confirmed his good condition by making it into the top 5 with a time of 22.17 but it was Thomas who took all the attention when he crossed the line in third.